 Chicago Wedding Venues: Part 1 | Luxury Toronto Wedding Planner | Devoted to You Inc.
There’s quite a bit of back-log with our blogging since we came back from our trip. We spent Chinese New Year’s Day in Chicago, and as Chinese tradition is concerned, we should visit our friends and families’ homes to wish them good fortune. So naturally upon our return we spent the latter part of the next week and half doing some catch up. We also kept busy from meeting new and exciting clients. Did I mention that we checked out some extravagant venues in Chicago? As you know, Chicago is a city of architecture and arts with a beautiful skyline. The city itself is a museum of architectural landmarks from old to new. If you start on the south side of The Magnificent Mile, you’re greeted by a 26 foot tall Marilyn Monroe! One of the hotels we stayed at was the Intercontinental Chicago on The Mile. It’s such a historical landmark, which was originally built in 1929 as a luxury men’s atheletic club for members of the Shrine organization. However, the club was closed due to stock market crash in 1934. In 1988, Intercontinental hotels bought the property, spent a quarter billion dollars and took 12 years to renovate it. The interior of the building was restored to its original demeanor with the contribution of photos and information from former club members. The hotel was then re-introduced to the public in 2001. A 4-storey high lobby with grand staircase welcomes you when you enter the hotel from Michigan Ave. There are 2 towers – the South tower, known as the Historic tower, was the original building of the club, and the North tower is the main building. The hotel itself has been the site for many of the most elaborate weddings and events in Chicago. We had a tour around the property. 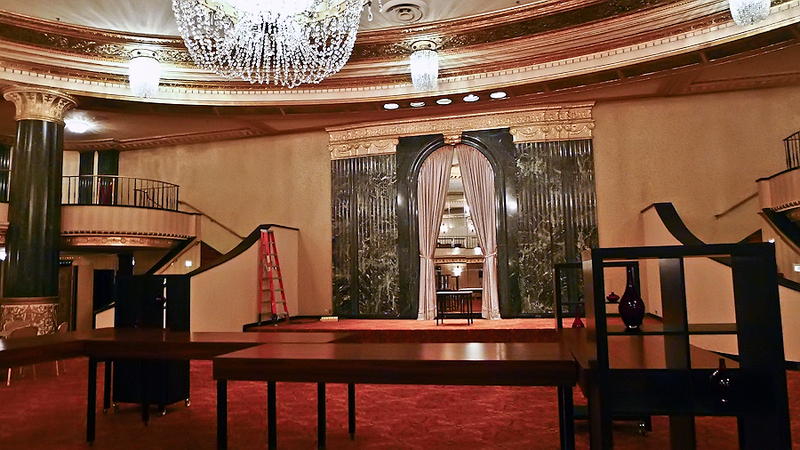 There are 4 historic ballrooms, each with different styles of architecture and decoration, and each can be accessed through their own private elevators. Whether you are having a wedding or corporate event, you have the exclusivity of the whole floor that comes with a cocktail area and a ballroom. The center of the room is decorated with a 12,000 pound Baccarat crystal chandelier, the largest Baccarat crystal chandelier in North America. This is a photo of the hall dressed up for reception. The capacity for the Grand Ballroom is 370 with dance floor on the main floor and 550 with the balcony and main floor with dance floor. Next is the Renaissance Ballroom located on 5th floor. When you step out from the elevator, you will see five Baccarat crystal chandeliers that are worth well over $1 million. The room has floor-to-ceiling windows facing the Magnificent Mile and the decor of the room is done in remembrance to the court of King Louis XVI of France with five Baccarat crystal chandeliers hanging from the ceiling as a feature of the room. This room can fit a maximum of 260 with a dance floor. To the right is the Spanish Court, where your guests will be enjoying their cocktail there prior to the dinner reception. The Spanish Tea Court was made to replicate the Spanish Era of King Ferdinand and Queen Isabella. It was one of the few places that allowed unescorted women when the hotel was still the Athletic club back in 1920s. The ornate fountain is the focal point of the room with blue ceilings to create the ambiance of an outdoor tea garden. Next is the King Arthur Court located on the 3rd floor. The room is very different in style compared to the other two ballrooms. The original full wall of stained glass makes a perfect backdrop for wedding ceremonies and receptions. The room is made to reflect the medieval times of Britain with cast iron chandeliers and hand painted ceilings. It can fit a maximum of 180 with a dance floor. Outside of the King Arthur Court is the Hall of Lions, which is included with the rental of the ballroom. According to the hotel, many layers of paints were removed to reveal the marble lions during the restoration process. According to the catering manager of Intercontinental Hotel, 25% of the weddings are from out of town couples. This says a lot about the popularity of this central location of Chicago from both east and west coast. 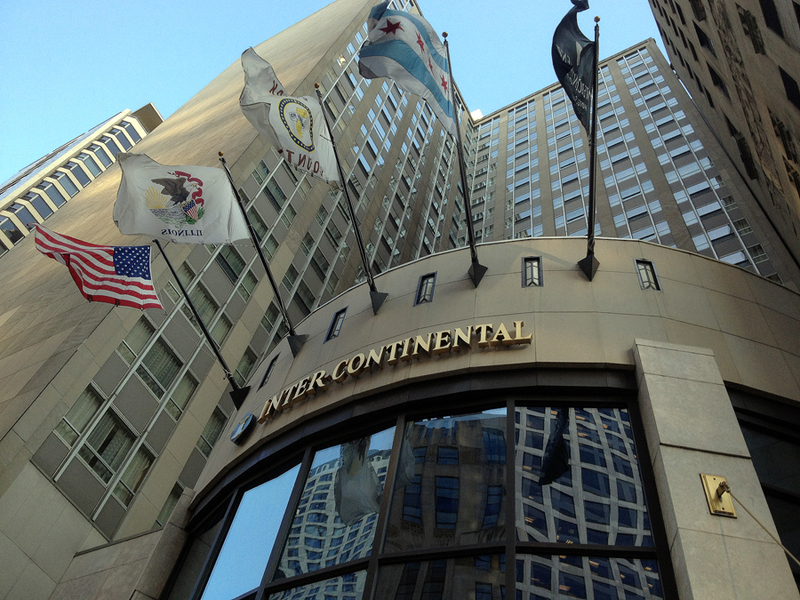 Hope you enjoyed the tour at the Intercontinental Chicago. We’ve got more venues to review, so stay tuned for more from Devoted to You in Chicago! landing page photo by facibeni fotografia|ProPhoto Photography Theme Design by Northfolk & Co.